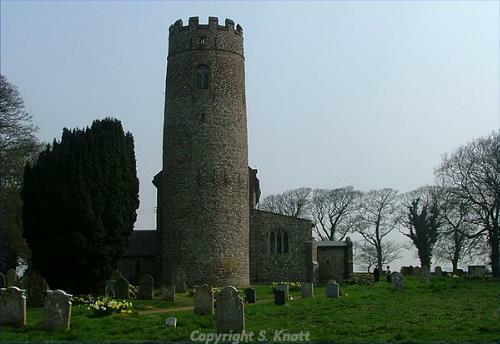 Witton is a large parish situated in the North Norfolk Local Government District, some 6km to the east of North Walsham. It has an area of 972 hectares, and contains the settlements of Witton and Ridlington. The name ‘Witton’ is thought to derive from the Old English for settlement near a wood, and ‘Ridlington’ may come from the Old English for Hrethel’s people’s enclosure. The modern day parish contains the medieval parishes of Witton and Ridlington, and is largely in arable use. Many of the fields were owned by a single landowner, John Owles, and his extensive fieldwalking and excavation in the 1960s and 1970s has resulted in an important body of evidence stretching across all the periods of occupation in Witton. It is a result of this work that large numbers of pot boiler concentrations have been recorded, numbering twenty-five. These have occasionally been recorded alone (NHER 7039, 7057 and 7070), but have also been recorded in conjunction with activity from across the periods, including prehistoric flints (NHER 6945 and 6956). Of particular interest is the site of three Neolithic pits or huts (NHER 12548), where pot boilers and flints were first noted in conjunction with patches of dark soil. As a result excavation took place in the 1970s and three features were recorded, visible as round or oval depressions. They were filled with Neolithic to Early Bronze Age pottery sherds and flints. Surface collection confirmed that flint working took place on this site during the Late Neolithic period, and it is thought that the depressions were filled with refuse during this and the Early Bronze age period. In addition to this feature, the cropmark of a possible Neolithic long barrow or enclosure has been recorded (NHER 16652), as has a possible long barrow or mortuary enclosure (NHER 39033). Both of these appear to be related to a late Bronze Age barrow linear cemetery nearby. Objects have also been recovered from over sixty sites across the parish, and these include axeheads (NHER 6921, 6922 and 6964) as well as scrapers (NHER 6938, 6951 and 6977) and a transverse arrowhead (NHER 6945). A large number of Bronze Age sites have also been recorded. As a result of intensive fieldwalking a possible Early Bronze Age pit (NHER 6969) was excavated in 1964/5. It was described as a ‘shallow depression’ which contained four or five Early Bronze Age beakers and a retouched flint flake. In addition a possible Early Bronze Age ditch and hearth (NHER 6949) was also excavated around the same time. 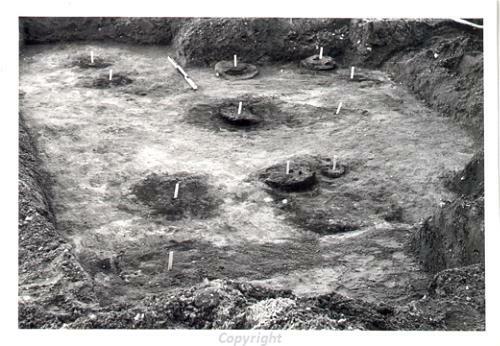 Photograph of the excavation of a Bronze Age urnfield in Witton in the 1960s. One of the most well known sites is a Middle Bronze Age round barrow (NHER 6920) situated on a promontory above the river, which has been excavated on a number of occasions and eventually fully in 1954. Evidence recovered during that investigation indicated that the barrow had been used repeatedly for cremations, and that it had been enlarged from its initial size. Of similar or possibly later date is a hearth (NHER 7018) which was seen as an area of darkened soil after deep ploughing. A pit containing Middle or Late Bronze Age pottery sherds with a heavy ash layer was noted, and in the same year a Late Bronze Age blade was recovered from the surface here. Around the same time ploughing disturbed another five Late Bronze Age urns, at least one containing a cremation (NHER 7023). In addition to these excavated features there are a large number of ring ditches recorded as earthworks and cropmarks and are thought to represent Bronze Age round barrows. A group of at least four forms a cemetery (NHER 39221) which has a linear southwest to northeast arrangement, and there are at least ten other ring ditches or enclosures which may be related (for example NHER 27238, 27232 and 45237). A small number of objects have also been recovered from the Bronze Age, and these include pottery sherds (NHER 1009 and 6938) and a Middle Bronze Age palstave fragment (NHER 6951). In 1964 a hearth was also excavated just southwest of Church Plantation, which was found to contain Late Bronze Age or Iron Age material (NHER 7028). Iron Age evidence is not as common as Bronze Age, but two Iron Age pits (NHER 6969) have been excavated to the north of St Margaret’s Church and these were found to contain abundant Iron Age pottery sherds and associated smaller pits and post holes. In 1976 a Roman ditch was excavated on the site, and in 1961 probing located the burnt clay wall of a Roman kiln (NHER 7023) in a field south of Crossways Cottages. It was thought to date to the 3rd century, and had been altered during a second phase of activity. No other Roman sites have been excavated, but cropmarks indicate the possible existence of over fifteen features. These include field systems (NHER 21835, 27228 and 27242), enclosures and ditches (NHER 27237, 38866 and 38872) possible trackways (NHER 38846 and 39226) and a possible farmstead (NHER 38866 and 39212). In addition a number of Roman period objects have also been recovered, and these include pottery sherds (NHER 6938, 6943 and 6951), steelyard weights (NHER 40250) and coins (NHER 40251), as well as a possible Roman metal plaque with a bust of Serapis (NHER 36772). The extensive fieldwalking and excavation of the 1960s and 1970s also recorded rare evidence for Early Saxon occupation. In 1967 and 1973 a site east of Park Farm was excavated and seven sunken-featured buildings were discovered (NHER 1009). These had internal and external hearths, at least one floor surface and a number of drainage ditches and soakaways to deal with rain water. Pits were also discovered on this site, along with iron working debris, crucibles, iron and copper alloy objects, jet, stone and green glass objects and spindle whorls and many pottery sherds. It is thought that this was a farm site during the fifth and sixth centuries. Just to north of Park Farm, around 100m from the above site, a further two sunken featured buildings (NHER 16641) were excavated. These appear to have been in use at the same time and possibly linked, and the fill of the slightly larger of the pair contained some thirty-six loom weights, some as large as a person’s fist. No Middle Saxon period buildings have been noted, but excavation in a field 200m southwest of the largest Early Saxon site discovered evidence of a rectangular timber building constructed with timber uprights and thought to date to the Late Saxon period. A small number of objects from the Saxon period have also been recovered, and although these are predominantly pottery sherds (NHER 6950, 6993 and 7017) an Early Saxon loom weight (NHER 18093) and a Middle to Late Saxon strap end (NHER 40250) have also been found. Both Witton and Ridlington are listed in the Domesday Book of 1086, which indicate the presence of a priest in Witton. Despite the evidence for Saxon activity in Witton, the settlement does not appear to have been particularly populous or valuable, and Ridlington even less so. Despite the mention of a priest, there is no listing or a church or chapel in the settlements. However the earliest surviving building in the parish is probably the church of St Margaret (NHER 6924) in the village of Witton. Although the building has been much altered over the years a 12th century blocked doorway remains in the nave, and this is the earliest visible surviving section. Inside is a 14th century octagonal font with multiple styles of tracery decoration, and one of only four known brasses commemorating a member of the Order of Vowesses, this one Dame Juliana Anyell. Ridlington also had its own church during the medieval period, and this was dedicated to St Peter (NHER 7079). Today the building is largely in the Perpendicular style, with a heavily restored nave and chancel. However a 13th century trefoil lancet and similar piscina survives in the chancel, and there is an octagonal 13th century font of Purbeck marble in the nave. No other buildings from the medieval period survive, although the site of a possible Chapel of Our Lady (NHER 6978) has been identified. However aerial photography of the area has been analysed as part of the Norfolk National Mapping Project, and as a result the cropmarks of a large number of features have been recorded. These indicate the presence of over twenty medieval features, including field boundaries (NHER 38693, 38842 and 39039), banks and ditches (NHER 38687, 38757 and 27241), trackways and roads (NHER 38846, 38864 and 39038) and field systems (NHER 38848 and 27236) and crofts (NHER 27229). Many of these features are thought to continue in use during the post medieval period. As with former periods, artefactual evidence for the medieval period is dominated by pottery sherds (NHER 6964, 6980 and 7017), although a number of medieval objects have also been recorded. These include strap fittings (NHER 7030 and 7053), coins (NHER 16646), tokens (NHER 33963), buckles (NHER 39915), a gilt horse harness pendant (NHER 40251) and a Norman decorated stone arch fragment (NHER 7051). Similar objects dating from the post medieval period have been found. A number of buildings from the post medieval period have survived, perhaps the oldest being Old Hall (NHER 7078), which dates to the 16th century and is of brick and flint and an original fireplace and 17th century staircase. Also dating to the 17th century is Dairy Farmhouse (NHER 22864), which has a mid 18th century thatched extension and a façade of 19th century brick. Later but perhaps more impressive is Park Farm (NHER 11557) barn, which is 45m long and dates to 1795. It is of brick and flint and retains its original roof timbers. The associated farmhouse is thought to be of the same period, and both appear to have been built soon after Witton Park, perhaps in order to help manage that land. Also of architectural interest is The Old Rectory (NHER 46645) which was built in the late 18th and early 19th century, and The Willows (NHER 47491), which dates to the late 18th century and is a good example of a late lobby entrance building. The World Wars also had an impact on the parish, which had a Navy Air Surface night flight landing ground during World War One (NHER 13613). This was decommissioned before World War Two, but a military camp (NHER 38819) and training area (NHER 38841), weapons pits and slit trenches (NHER 38821 and 38822) and ant tank defences (NHER 45232) were all built in the parish during World War Two. Today only a single pillbox (NHER 32623) and some defences (NHER 38983) survive.